Have you had a good start to your weekend? If you were inspired to try sprouting at home as discussed in the last post – here is a simple idea for what you could make with it in under 15 mins! 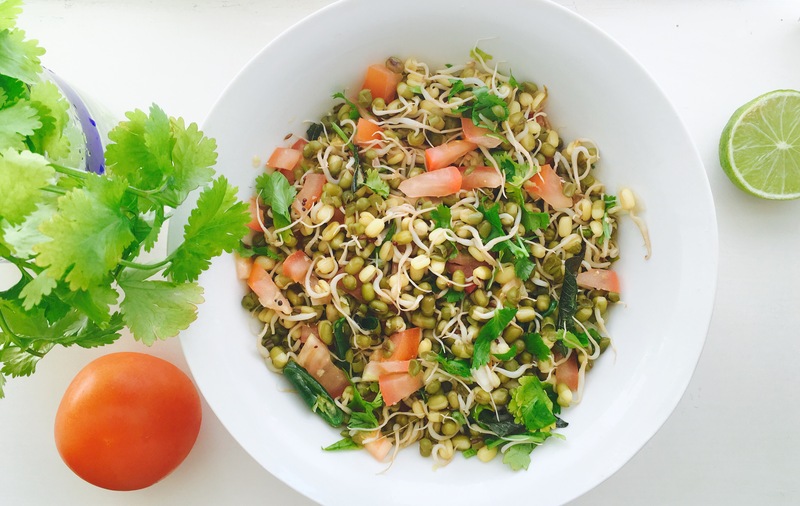 I’ve used about 3 handfuls of sprouted moong beans for this recipe, if you just tuned in and would like to know how to sprout at home then please take a peek by clicking here! Then for the dressing – to a small pan on medium heat add the oil,once hot, add asaofoetada, mustard seeds, ginger, cumin, green chilli and fry them briefly for about 30 seconds then turn off the heat immediately. Back to the sprouts – once the 10 minutes are up turn off the heat and place the sprouts in a serving bowl, then add the dressing you made earlier in the pan along with the chopped raw tomatoes, coriander leaves and onion – mix well. Finally squeeze lime and serve! Lovely!! This will be a fun deviation from the raw sprout salad that I make. Looks wonderful! I usually make it without cooking the sprouts and will definitely try this next time! Thank you!! Your pictures are awesome too!